The Self-Published Fantasy Blog-Off #SPFBO was, in my estimation, a great success. We took in 273 self-published fantasy manuscripts and 10 top bloggers gave out around 100 reviews, in the process picking ten finalists and an eventual winner. The first round of the 2016 competition is complete and you can see how the ten finalists fare here. Now closed to new entries. We have 300 entries in! SPFBO 2016 is on. Scroll down for contestant list and updates. iii) The book must actually be self-published, not something you're considering self-publishing in future. a) Put on a pseudo-literary agent hat and accept a randomly allocated slush pile of 25+ electronic fantasy book manuscripts and work through them to find their favourite single submission which they will then "publish" into the final round of the competition. b) Review at least the book they put through into the final. c) Read through the final list (9 books plus the one they put through) and score those books out of 10 to generate a cumulative score for each of them which will be used to determine the over all winner. d) Review the over all winner. There's no other prize. The winner will get the publicity of being the winner, plus the bonus of being reviewed on the blogs of 10 highly respected fantasy bloggers. Frankly you can't buy better publicity than that. The winning book will have been selected as the best from a field of 300 self-published works. The first stage will take not more than 6 months - but if everyone makes their selection earlier we can move on. The second stage will take not more than 6 months. All you have to do email me the electronic manuscript ready for kindle/PC reading or (if one exists) the link to the FREE version on Amazon. You're welcome to include a cover letter, blurb. synopsis etc as you would for an agent - but it's not compulsory. These guys are bloggers, they're used to making up their mind by starting to read and seeing if they feel any compulsion to continue. I will be maintaining a list here of #SPFBO links to posts by the bloggers and also relevant blog posts about the contest. You may find other interesting links by Googling in SPFBO or searching for the hash tag on twitter. Former contestant G.R Matthews gives advice to this year's entrants. All 10 of last year's finalists are appearing together in a story bundle! An interview with David Benem, a finalist from 2015. On Pornokitsh an introduction to, and thoughts on, the contest. On Bibliotropic Ria talks about 'the process'. On Bookworm Blues Sarah also talks process, and covers! Ria's first reactions to the first few titles. Bibliotropic. On Bibliosanctum the team introduce their titles. Ria's third ... first .., impressions! Fantasy-Faction introduce their team and methodology. Lynn tells us 'there can be only one'. Sarah on Bookworm Blues is very orderly. First chapter thoughts at Fantast-Faction. Ria asks whether you want to take your medicine? On Fantasy Book Critic Mihir sets out his stall. Pornokitsch assesses 24 to be let go and names 6 to be given full reads. On Bookworm Blues Sarah's first round of reviews. Bibliosanctum talk about their cover choices. Lynn considers her first 5 on Lynn's Books. A second round of reviews on Bookworm Blues. A second round of 5 selected on Lynn's Books. Fantasy Literature opens procedures with a GIVEAWAY! Pornokitsch reviews the first of their 6 semi-finalists. Pornokitsch reviews the second of their 6 semi-finalists. Three of six semi-finalists now reviewed on Pornokitsch. Kirsten S Walker puts out the 3rd in her SPFBO reviews. Four and five of six semi-finalists reviewed on Pornokitsch! Pornokitsch reviews the last semi-finalist. Lynn's Books considers 5 more titles. On Bibliotropic Ria wields the scythe once then twice. The crew at Fantasy Literature pick a first semi-finalist. Third batch from Sarah at Bookworm Blues! Fantasy Book Critic address their first batch. The Narrowing Path reviewed on Bibliotropic. We have our first finalist, and you can feel Jared hurting over the decision on Pornokitsch! Fantasy Literature roll out their round 3. And 5 more gone at Fantasy-Faction. Another 5 titles cut at Fantasy-Faction! Ever taciturn Elitist Book Reviews review their first title! Lynn selects her next 5! Fantasy-Faction shed 5 more books. On Bibliosanctum some pontification of the SPFBO. A 2nd book reviewed on Eitist Book Reviews. On Bookworm Blues Sarah selects another semi-finalist. Bibliotropic reviews Touch of Iron. Lynn's Books spotlights another 5 titles. The last group is mini-reviewed on Bookworm Blues! An epic struggle to choose between two books leads to one finalist on Bookworm Blues! Bibliotropic reviews A Dragon Scale Lute. Bibliosanctum reviews Beyond the Starline. 4th update on Fantasy Literature. Lynn's Books reviews The Amber Isle. Demi Heroes is reviewed on Bibliotropic. Terminus is reviewed on Fantasy-Faction. Elitist Book Reviews choose Larcout as their finalist. Beneath the Canyons reviewed on Bibliotropic. On Fantasy-Faction Yseult is reviewed. Lynn spotlights her 5th set of books. Fantasy-Literature wield the axe on 5 more books. Fantasy-Literature shine the light on 5 more titles. Off Leash gets a review on Fantasy-Faction. On self-promotion and self-publishing. A blog post by ME! On Fantasy Book Critic the final six of batch 3 are named. A Song of Blood & Stone reviewed on Fantasy-Faction. Ria reviews Thread Slivers on Bibliotropic. Fantasy Literature choose their winner! Bibliosanctum review The Dragon's Blade. Transition is reviewed on Bibliosanctum. Fantasy-Faction have just two books left! The final set of five books spotlighted on Lynn's books. On Fantasy Book Critic the author of Storm Without End is interviewed. Bibliotropic reviews The Grey Bastards. Ria identifies Bibliotropic's final two! Powers of the Six is reviewed on Fantasy Book Critic. I interview three of the authors whose books came 2nd in a group. Hondus Pointe reviewed, author interviewed, on Fantasy Book Critic. Unwilling Souls reviewed on Lynn's Books. As the Crow Flies is reviewed on Lynn's Books. Outpost is reviewed on Lynn's Books. Lynn considers her final batch of 5 and picks her finalist! On Bibliotropic Ria chooses a finalist! The Qwillery choose their finalist! Fantasy Book Critic look at three more of their semi-finalists. Fantasy Book Critic selects their finalist! I've started a 'best cover' contest for the SPFBO covers. 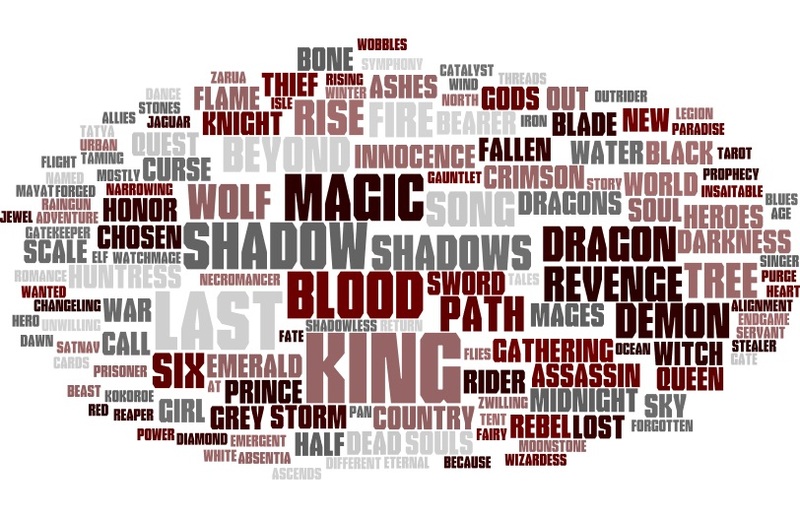 Here's a Wordle made from the first 250 titles! How have the first 276 entrants chosen to present themselves gender-wise? From inspection I would say that the majority (but by no means all) of the authors using initials are female. Here's one from Brent Nichols - any more? Almost everyone who sent in thanked me for the opportunity. And it is a great opportunity - but let's take a moment to keep expectations real here. We have 300 entries. Each blogger is going to select the book they feel is best from the 30 entries sent to them. That means that 97% of you will fail at the first hurdle. That's just the unforgiving mathematics of the thing. 1. Rob J Hayes - It takes a thief to catch a sunrise.